Silence. Dimly-lit chandeliers and flickering candle lights yellowed the breadth of the hall. The measured chiming of her ghungru in perfect sync with the beats of tabla went on and on freezing the sense of time. Nahid Siddiqi’s Kathak performance at a Supporters of The Citizens Foundation’s fundraising event, celebrating the classics of great Sufi poet and musician of the Indian subcontinent Amir Khusro, cast a rare spell of magic on the audience. It was veritably an enactment of an evening founded only in the books of literature or paintings stilled forever by anonymous artists at some princely court of Mughal India; it was virtually a rendezvous with history. The event was hosted by Zia Mohyeddin, who clued up the audience with his encyclopedic knowledge of Indian classical music and the sheer impact of Amir Khusro in shaping the genre in so many ways. Speaking on the occasion, Mushtaq K Chapra thanked the supporters of The Citizens Foundation (TCF) and revealed that their help had enabled the TCF to run 730 schools across the country and impart quality education to 102,000 underprivileged children all over Pakistan. Some of the leading names in contemporary classical music in the country performed Khusro’s Ghazals in Persian, Hindi and the hybrid languages that he wrote in, and played instrumentals of his famous compositions. “The native Persians (Iranians) don’t have a very high opinion about Persian literature that came out of the Indian subcontinent. They don’t even see Ghalib as someone significant, but when it comes to Khusro, the Persian critics are silent in awe,” said Mohyeddin, who was not only the MC of the show but played he role of a performer, narrating in his signature style the history of the giant of Indian classical musician. The performers mainly comprised the alumni and faculty members of the National Academy of Performing Arts (NAPA). Nafees Ahmad on sitar, Ustad Bashir Khan on Tabla, Ustad Mubarak Ali Khan on harp, Mohammed Hussain on harmonium and Ustad Salamat Hussain on flute made up the orchestra for the singers who took turns to pay their tribute to Khusro. Ustad Salamat Ali, Mehnaz Begum, Ustad Nasreuddin Saami along with a troupe of young singers from NAPA performed. 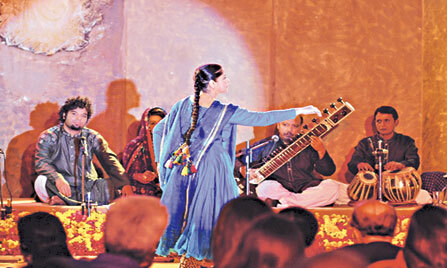 When the famous compositions of Khusro like Mera Piya Ghar Aya and Mankunto Maula were performed by the Ustads with the utmost classics finesse, keeping the subtleties of ranges and the intricate structure of the melody just on dot, with perfect stretches of the highs and lows, the audience broke in applause. To commend many a time in between the performances, say, a long breathless stretch of note or an intense sweeping stroke of sitar and table together. But Nahid Siddiqui simply dazed. The critically acclaimed international Kathak dancer performed after a long time in Karachi, and to say the least, she made her presence on stage not only felt but a memorable one.